When writing a datasheet, web copy, case study or other collateral piece, I start by thinking about what the first paragraph should say that will make the reader want to keep reading and learn more. For a new website, I think first about what the home page splash screen should say and what graphic should accompany it. If that first impression message is not compelling, your audience will most likely tune out rather than bother to continue paying attention. For a presentation deck, I like to define a really good “icebreaker” slide first before anything else. It might be a compelling – even alarming – stat with a strong supporting graphic. It can be a quick story or interactive game, as long as it is directly relevant to your presentation. I once attended a breakout in which the presenter led off with an awkward “tell to your neighbor something interesting about yourself” exercise that had nothing to do with his chosen topic. It merely distracted the audience from his presentation. My friends and colleagues know I generally like to go with humor; for example, I recently led a presentation on replacing expensive commercial software with reliable, supported open source technology. My icebreaker slide was this excerpt of a classic Calvin & Hobbes comic strip. I wanted to convey, in an engaging way, the core message that no one likes to feel like they’re being ripped off, forced to pay too much for something, and not being treated fairly… and that includes paying too much for commercial licenses with pricing accelerants and legalese intended to lock in their customers. Notice too how Moe, the bully shaking Calvin down for a quarter, is now in the minds of the audience as a symbol for their unrepentantly high-cost commercial software vendor taking too much of their money. From that intro, slides presenting the proof points for smart and substantial open source savings and how to get started flowed naturally from that icebreaker. “Begin with the beginning in mind” also applies to demand generation emails. Even before the intro paragraph, come up with the subject line. I have received three emails in a row from a vendor, each with the same bland subject line of “[Company Name] Newsletter — New e-Book”. I can’t imagine the open rate for these emails is anywhere near acceptable. I don’t accept the notion that email marketing is dead; only that poor email marketing is dead. During the company’s recent Boston World Tour stop, Salesforce.com agreed. Going beyond A/B testing, SFDC proceeded to present new features to make it easier to personalize email subject lines to optimize engagement as soon as the email hits the inbox. Begin with the beginning in mind. 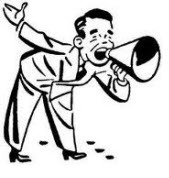 As frustrating as it is, if the beginning of your message is not engaging, the end and middle of your collateral, no matter how fine, scarcely matters. But if you spend the extra time up front by beginning with a great beginning, a great introduction, you’ll find the rest of your message will flow from there much more easily – and your target audience will be much more willing to receive it and act on it. I recently read an article posing the well-known sales question, Is Your Product a Vitamin or a Painkiller? by George Deeb. It’s a good reminder that it’s better to be selling a “painkiller” technology product that relieves acutely-felt, pervasive business problems, rather than a “vitamin” product that offers some lesser, more specialized value. I agree with Deeb that it’s much harder to build a large, scalable business around vitamin products than painkiller products, but a product-as-painkiller is not the ultimate or best product offering either. In other words, the question “Is your product a vitamin or a painkiller?” is a false choice – and businesses that rely on painkiller product revenue are at more risk than they might realize. Meanwhile, new enabling technologies march on: painkiller products that once required a huge capex for on-premise enterprise software, servers and services (CRM, marketing automation, legacy BI) are now offered inexpensively on a SaaS basis (SFDC, Marketo, GoodData) with more to come. More and more painkiller products are becoming available at lower “vitamin-level” cost and simplicity! Another issue I have with painkiller products is they implicitly assume a business status quo. Consider Polaroid in the mid 90’s. Like so many other large companies, Polaroid jumped in with both feet into ERP, the ultimate painkiller technology of its time. Polaroid even won major awards for its SAP implementation. While Polaroid’s ERP no doubt lightened many operational pains by optimizing inventory, purchasing, quality control and such, meanwhile the company was failing miserably with new products and all but ignoring the deterioration of its instant photography market to digital cameras. I recall reading a Polaroid executive praising the company’s new operational efficiency of its instant photography “core business.” Not long after, in 2001, Polaroid filed for bankruptcy, with most of that “core business” long gone. There is only one valid definition of a business purpose: to create a customer… Because the purpose of business is to create a customer, the business enterprise has two – and only two – basic functions: marketing and innovation. For top management, information technology has been a producer of data [for operational tasks]… Business success is based on something totally different: the creation of value and wealth. This requires risk-taking decisions… on business strategy, on abandoning the old and innovating the new… the balance between the short term and the long term… These decisions are the true top management tasks. These and other new technologies designed to enable innovation make up a third category of products that go far beyond painkiller or vitamin products. The National Football League’s (NFL) petty 2012 lockout dispute with the NFL referees union has officially ended. Not a moment too soon: The “real” referees will return to officiate all Week 4 games – just in time for the early Thursday Night game – rescuing the rest of the football season from further tarnish, embarrassment and harm at the hands of incompetent replacement referees. Before the 2012 season began, players and analysts warned NFL Commissioner Roger Goodell that the poorly qualified fill-in referees would lose control of football games. They did. The rightful outcome of games would be altered by poor calls and non-calls. Oh, were they ever. And repeated failure to call serious personal fouls would put players at needless heightened risk of serious injury. Sadly, and most unacceptably, that happened as well. I thought, what other organization, #1 in its field, has ever made such a major non-forced mistake, causing highly visible, self-inflicted harm? My answer rewinds back to my freshman year, Intro to Business, first case study: Schlitz Beer in the 1970s. Once the #1 beer in America, as equally an iconic brand as Budweiser, Schlitz proceeded to lose nearly all of its value by that decade’s end, thanks to inexplicable, self-induced sabotage of its own product. Ever Feel Like You’re Being Treated Like “The Fighter” at Work? The Fighter (2010) is an exceptional movie based on the true story of Micky Ward (portrayed by Mark Wahlberg), a professional boxer from Lowell, Massachusetts. Set in the early 1990’s, the film introduces Micky Ward as an aging boxer whose champion potential is slipping away as trusted family members fail to look out for him. Stymied by his drug-addicted brother Dicky (Christian Bale) missing training sessions and his mother Alice (Melissa Leo) badly mismanaging his matches, Micky Ward suffers a series of embarrassing defeats and considers ending his boxing career. The Fighter led me to wonder how many people are out there today with similarly high potential being similarly squandered. Does this suggestion ring true to you? I am certain the vast majority of people (certainly not just product marketers and product managers) have felt the same gnawing cognitive dissonance during their careers that Micky Ward felt: an awareness that one’s work and skills were somehow being stifled. I believe the root cause behind the vast majority of struggling products (and, therefore, struggling businesses) is people not living up to their potential due to a non-supportive organizational environment. Like Micky Ward’s frustrations early on with his family members in The Fighter, too often executives and senior managers fail to lead effectively and treat workers with respect and civility. Leadership that is disengaged from the company’s original innovation and brand equity. Beware of management who was not around and/or not emotionally invested in the company’s original innovations that earned its success and brand equity in the first place. Starbucks is one example of post-founder management that missed the mark badly. After original visionary CEO and chairman Howard Schultz’ retirement from Starbucks, the company pursued a nearly ruinous ‘management by the numbers’ strategy along with massive over-expansion that made the company less like the original Starbucks and more like Dunkin’ Donuts. Thankfully, Starbucks is also a success story in recapturing that innovation, and rescuing its brand following the return of Howard Schultz to the company. There are many far worse examples out there, from so-called “professional” turnaround management teams to the likes of James Kilts, the last CEO of Gillette, who simply abdicated his responsibility to cultivate innovation to grow the top line and revitalize the company. Instead, Kilts simply declared that past double-digit revenue growth was a thing of the past. He instead fixated on shareholders as the only company stakeholders, overseeing massive layoffs and cost-cutting. With a compensation package larded with stock options, Kilts predictably sold Gillette in 2005 and pocketed $165 million. A Boston institution, with untapped potential to rediscover its innovative roots, became just another division of Proctor & Gamble. In an organization with a management team that has merely inherited the fruits of innovation from previous leaders, innovation becomes devalued and “leaders” take short-sighted actions, often based on their “knowledge” of the cost of everything and the value of nothing. Leadership that punishes unsuccessful innovation. If you say, ‘I want people to take risks,’ and then fire the guy if the outcome fails, it becomes clear how your organization really feels about risk. The bus boy looks his boss in the eye, shrugs his shoulders, lets the other armload of dishes fall crashing to the floor as well, and walks out. The lesson is clear: a company culture that burns out workers and punishes them for honest mistakes, and even worse, for taking a risk and trying out a new idea that doesn’t work out, deserves the plentiful fallout it creates. Nothing stifles innovation (or, for that matter, careers, information sharing, customer service, etc.) like a ham-handed “slap on the wrist” from an authoritarian boss. Leadership that fails to reward (or even recognize) successful innovation. Failing to appreciate or acknowledge innovation success might even be worse than scolding unsuccessful efforts. I recall some years ago reading the 1985 book Intrapreneuring: Why You Don’t Have to Leave the Corporation to Become an Entrepreneur by Gifford Pinchot. The book described an ingenious manager who single-handedly created a new multimillion dollar stream of revenue for his employer. The manager discovered an innovative breakthrough that transformed tons of scrap material previously hauled away as waste into a vital component of a new product. [The manager] doesn’t seem bitter that he barely received a thank you for creating a new business…He is from that loyal generation who is thankful for a job, and my questions about recognition and rewards made him uncomfortable. This feeble conclusion debunks the book’s own premise; after all, an entrepreneur in charge of his or her own company actually reaps the rewards of his or her innovation, rather than having them gobbled up without even a “thank you” by an indifferent executive team! In addition to conveying the cynical notion that the manager “should just be thankful he has a job,” the company made a very loud and clear statement about how little it valued innovation and those who engage in it. I’m sure that message was received loud and clear, and remembered, by others across that organization. Leadership that is preoccupied with “problem solving,” not innovating. Referring to the previous sad example, problem solving would have amounted to simply finding a new vendor willing to dispose of ‘all this worthless material waste’ for a few nickels less than the current cost. Innovating is what that manager actually did, turning that scrap material into revenue-generating gold. I discussed this issue in a recent article exploring the Hierarchy of Imagination, in which I suggested that many boss-subordinate conflicts stem from incompatible levels of imagination, such as a highly “creative” person reporting to a “left brain”-focused, “problem solver” boss – more likely to be focused on “the numbers” while paying lip service at best to innovation. In The Fighter, Micky Ward’s fortunes begin to change when he begins to surround himself with professionals who set the right environment and agenda to start setting him up for success. Similarly, in the world of work, I hope your company’s leaders and managers are also setting the right environment, agenda and vision to innovate – thereby setting up the company, your co-workers, and you for success. What Flavor is Your Cupcake? I’ve been meaning for a while to write about the simple and clever Cake Model for Product Planning, a smart product management methodology by Brandon Schauer of Adaptive Path, a user experience (UX) design firm. The cake model helps launch desirable products as quickly as possible, and in so doing, help customers achieve positive, successful product experiences as quickly as possible as well. The Adaptive Path Cake Model urges product managers not to try making a big huge honking cake of a product. That requires baking a very a big cake (on its own, rather plain and dry), then adding some filling, and then some frosting. Hopefully your target markets are willing and able to wait for all that, and the finally-completed cake is the flavor, texture, etc. they were expecting. Instead, product managers should first spec out a cupcake of a product that be made relatively quickly, with a small amount of cake complimented with enough filling and frosting to make people want it – and get value from using it – right away, as is. Users achieve success and a sense of competency with the product now, and eagerly look forward to enhancements. For more on the importance of getting your users past the newbie threshhold with your product to passionate user, check out this classic post – one of my favorites from Karhy Sierra’s Creating Passionate Users blog (archive). One cupcake product model example that comes to mind is the online to-do app TeuxDeux. Instead of trying to bake the entire cake of “everything” that belongs in a to-do app, TeuxDeux offered up a quick cupcake: a dead-simple online to-do application for people who might find the very wide and deep features of more comprehensive to-do apps like Remember the Milk a bit intimidating. Users raved about TeuxDeux’s highly intuitive “cupcake,” and have since provided over 10,000 enhancement suggestions, culminating in new online features as well as an iPhone version. With thanks to a tweet by Donald Farmer, I recently came across an impressive graphic representation of the increasing degrees of human imagination. Brennan’s Hierarchy of Imagination was designed by John Maeda based on his conversation with Patti Brennan of the University of Wisconsin-Madison. 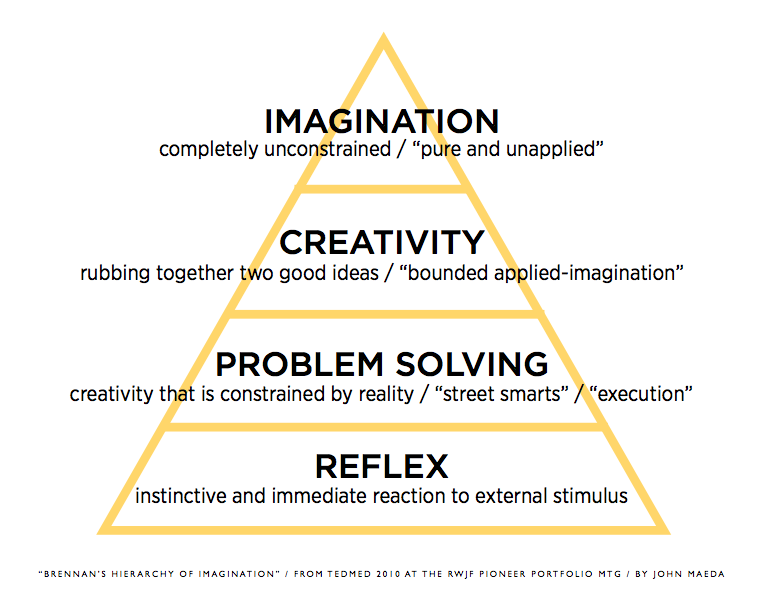 Similar in design to Maslow’s classic Hierarchy of Needs, the Hierarchy of Imagination is represented as a pyramid progressing from the base of reactionary behavior with little or no imagination (Reflex), proceeding upward to Problem Solving, then Creativity, and finally the pinnacle of “completely unrestrained” Imagination. It is a very thought-provoking, very useful model. The hierarchy should not be interpreted as disparaging jobs in which little creativity or problem solving is expected. What sets a worker in such a job apart from others is the level of wisdom they bring to their job (Read more here). That said, a person in the Reflex category had better not find himself in a Peter Principle job situation and be expected to proactively solve problems or provide creative leadership. Many boss-subordinate conflicts stem from incompatible levels of imagination. A product manager who spends his time gathering customer enhancement requests and prioritizing bug fixes (Problem Solving) will likely find himself in trouble with his VP who expects him to creatively identify new, ground-breaking features for the next version of the product. Conversely, a “left brain” business owner who prides herself as a Problem Solver is more likely to fail to appreciate the creative work of her marketing manager. She might even be reluctant to recognize new business leads are being generated by creative, engaging marketing programs, choosing to be preoccupied instead with supposed “flaws” as to “how” those marketing programs were executed. Problem Solvers should beware of creativity blind spots. With the thought in mind, I read an article linked on John Maeda’s blog on the challenges creative people might face when pursuing leadership roles. I’m willing to wager that many of those surveyed demonstrating ambivalence towards creative people tend to fit into the imagination hierarchy as Problem Solvers themselves, strongly focused on successful project administration but also generally unaware of the creative value and ultimate business impact of a project’s deliverables. To paraphrase a passage I recall from a Tom Peters book, ‘the project was ahead of schedule and under budget… but no one cared about the final product!’ Such Problem Solvers risk losing their creatives, and with them, their capacity to innovate, gain the attention of new prospects and keep existing customers. In fairness to Problem Solvers, creativity needs to be directed carefully. Product manager turned CEO Barbara Tallent warns product managers to avoid working on “just the cool stuff” instead of what customers have already said they need and will pay for. Read more here. The further you go up the imagination hierarchy, the more vital your skills of persuasion will be. In order for a creative person or someone with “completely unconstrained” Imagination to achieve his vision, he will need to effectively brief others in the organization on the merits of that vision. And if their boss is that prideful Problem Solver, they must effectively “manage up” and earn the boss’ buy-in, enthusiasm and support. Read more here. You can’t “teach” creativity, but you can help cultivate it. On this issue, I really like Patti Brennan’s comment: “teaching creativity doesn’t work but expanding their imaginations might work better.” In her work in patient healthcare, Patti Brennan believes “that in order to get patients to take control of their health, they need to imagine what it looks like to be more healthy.” Well said! The ability to visualize something better than what you are already doing is vital for creativity. Similarly, creativity requires a capacity to empathize with others, whether we are talking about the health problems of patients or the challenges and frustrations of our customers. Good product management and product marketing professionals can translate their empathy towards what customers are going through into well-defined products and clear, relevant, engaging messaging and content. I found Brennan’s Hierarchy of Imagination very insightful and I look forward to reading more from John Maeda’s Creative Leadership blog.